There is good news to share from Spokane. Jason has landed a job at the Gap store in town and starts on Sunday. Given the state of the economy and job market he has done very well in finding one so soon. In the meantime he and Pete have been busy creating. 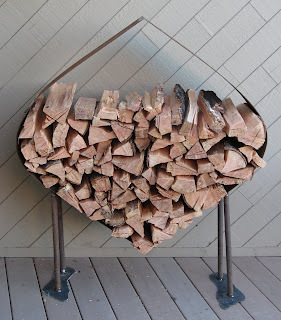 First a nice new kindling holder in preparation for winter. We are having such great weather that its hard to believe there will even be one this year. 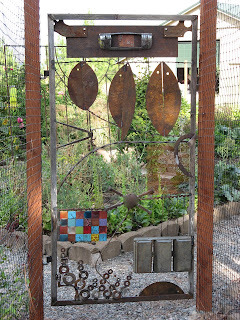 Our first of three gates has been completed in the veggie garden and boy what a great work of art it is. Pete and Jason have nicknamed their creation the fish-hatch. It is the entrance near mom and dad’s house and in honor of our mom’s maiden name. We are all very proud to be half FISH. The last two weeks have been very busy preparing for our trip to Vietnam and making sure everything on the work front is up to date. 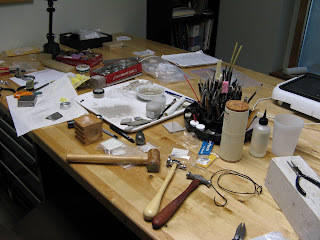 I have now realized that the studio will remain a mess until my return and some things will be left undone. I hope to leave a little list and perhaps some of it might be done before I return. It is all about the power of positive thinking, right? It is time to start packing and here are a few of things I am taking for our workshop which brings me to the 50 lb dilemma. It is always a challenge to abide by the new weight restrictions when you teach as Sue can attest. Hopefully the packing gods will be with us and we wont need to discard our underwear and other necessities at the curbside check in! We will be meeting up with Della of dellaQ at the airport. It is through her efforts that we are on this journey so visit her website at www.dellaq.com to find out more. We are looking forward to sharing some time together. We hope to be able to keep in touch with you as we travel but if problems arise we will blog all about it upon our return. Keep creating and enjoy the last throws of summer.